Topping charts before their official debut, co-ed group K .A.R.D is one of the most popular rookie groups of 2017. SubKulture Entertainment, in partnership with DSP Media, is excited to announce K.A.R.D’s first ever appearance in the U.S.! “WILD KARD” 2017 THE 1ST TOUR IN AMERICA will be arriving this May! The fanmeet will be coming to three major cities: Chicago, Houston, and Los Angeles. The Chicago show will be taking place on Friday, May 5, 2017 at the Copernicus Center, the Houston show will be taking place on Sunday, May 7, 2017 at Stereo Live, and the Los Angeles show will be held on Wednesday, May 10, 2017 at The Theatre at Ace Hotel. 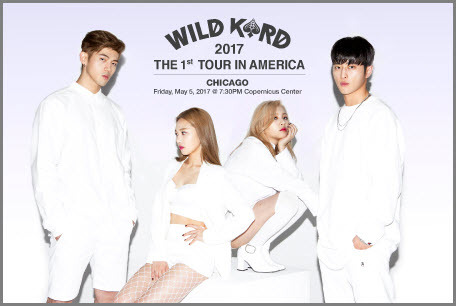 Tickets for “WILD KARD” 2017 THE 1ST TOUR IN AMERICA will be going on sale Saturday, April 15, 2017 at 10:00AM Venue’s Local Time. Prices and benefits include: $135 (Guaranteed Group Photo), $105 (Guaranteed Hi-Touch), $65 (Exclusive Signed Poster), and $45. Consisting of two male rappers (J.Seph and BM) and two female vocals (JEON JI WOO and JEON SO MIN), K.A.R.D is a co-ed group from DSP Media. Their name stands for King, Ace, JokeR, & HiDden. They impressed the world with the release of two project singles, ‘Oh NaNa’ featuring hidden member and label mate, HUR YOUNG JI and ‘Don’t Recall’ with a hidden English version; Their highly anticipated third project single is to be released soon. Being the first co-ed group in quite some time in the K-pop world, K.A.R.D has garnered a lot of attention with each single charting worldwide. ‘Don’t Recall’ hit #1 and ‘Oh NaNa’ hit #2 on the U.S. K-pop iTunes chart. ‘Don’t Recall’ hit #5 and ‘Oh NaNa’ hit #6 on Billboard’s World Digital Song Sales Chart. The group is currently shooting a music video for their new track, which will be released in mid-April. The members of K.A.R.D will be preparing to officially make their debut sometime within this year after the release of their third single.